If you want to generate higher-quality leads while dramatically improving the efficiency of your sales funnel, lead nurturing has to be part of your sales process – that’s a no-brainer. Forrester Research reports that companies that excel at lead nurturing generate 50% more sales-ready leads at 33% lower cost. While lead nurturing makes complete sense for businesses that want to generate more revenue and decrease customer acquisition costs, it’s not always easy to put a process in place. It takes more than investing in a lead nurturing tool to nurture cold leads into sales-ready prospects. You need a solid lead nurturing strategy to close the gap between failure and success. With a small business CRM and marketing automation software, you can implement any of the lead nurturing tactics you need. For instance, you can send autoresponders to a lead that fill out a form on your website. You can create a 5-step nurturing campaign. You can automatically create follow-up tasks for your salespeople. To really excel at lead nurturing, you have to understand how you can help move cold leads down the sales funnel into hot prospects. When you’re selling a product like socks or clip-on ties, there’s little explanation needed. But when you’re a B2B business selling something more complex – like a new technology, a program or a service, you have to provide more context. Your audience might not understand why they need you. They may not even know a solution like yours exists. Lead nurturing is an excellent way to educate your leads over time, especially when they are not actively searching for a solution. Instead of confronting cold leads with a sales pitch that they aren’t interested in, you can uncover their pain points and introduce solutions over time. Nurtured leads experience a 23% shorter sales cycle (Market2Lead). So don’t wait for your leads to discover you’re the solution they’ve been looking for. Be proactive with lead nurturing. Send a drip email campaign to your new leads. Include a link in each email to drive them back to a blog post on your website that addresses an issue they may be facing. Create an email course that leads can opt-in to. Provide a daily lesson on how to solve a pain-point your audience faces. Lead nurturing emails get 4-10 times the response rate compared to standalone email blasts (DemandGen Report). Unlike a general email newsletter, content in lead nurturing emails can be highly tailored to the recipient. Understand what content your leads will be interested in at which stage in the sales funnel to deliver value and help them along the path to conversion. For instance, say you are a manufacturing company. You sell a part that reduces friction and saves fuel costs for commuter trains. A new lead may not be looking for your specific solution, but they may be extremely interested in cutting fuel costs. You can send them a guide to cutting fuel costs, and use it to introduce them to your product. A hot prospect, however, may know about your product and be very interested in your solution. You can send them a link to your pricing calculator that calculates the cost to install your product and their fuel savings over time. Curate content or develop your own content on your website so you can easily send highly-relevant content to your leads depending on what they’re interested in, and how close they are to making a buying decision. With marketing automation software, tags can be used to label your contacts’ interests – by the pages they visit on your website, the links they click, and the forms they submit. Contact record details, like contact status and contact score can tell you how hot or cold a lead is in your database. Marketing automation can help you pull dynamic lists based on your contacts interests, or even start contacts on personalized campaigns. Using lead nurturing has shown to convert 15-20% of the “not yet ready to purchase” opportunities into sales (Gleanster). 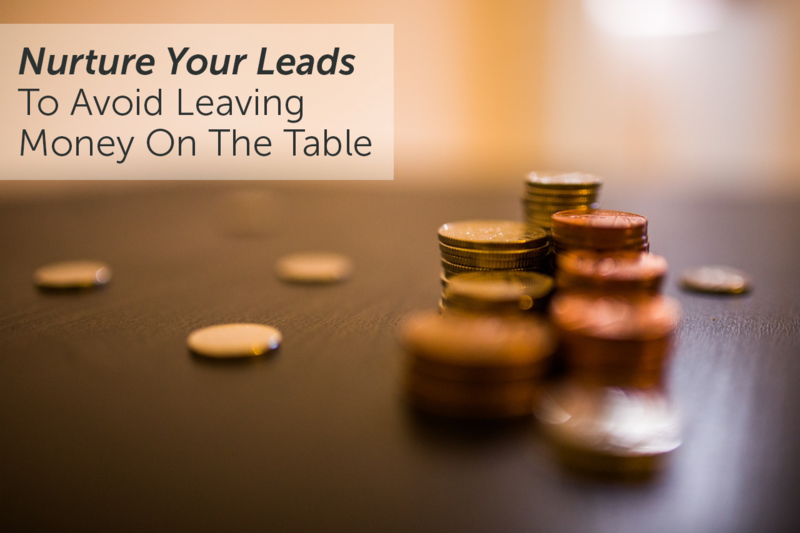 Staying top of mind with your leads can help you squeeze revenue out of your sales pipeline that would otherwise be left on the table. At the same time, following up too aggressively can lead to email fatigue, causing your leads to opt-out of communication from you. Understanding how many days on average it takes a lead to convert to a customer can give you a good indication of how often to follow-up. For instance, if your sales cycle is 12 months, you probably don’t want to follow-up every week. Determine how many touch points you need to convert a cold lead into a customer, then plan on the best way to follow-up. A mix of calls and emails can help lead prospects down the conversion path. Use triggered emails to stay top of mind. For instance, send a birthday promotion or holiday greeting. Use automated tasks or notifications to help your sales team stay in touch with leads. Create an automated reminder to check in with warm prospects every 30 days. Lead nurturing is effective because it puts your business on a buyer’s radar early in the buying process – sometimes, even before they realize they have a need. Instead of using pushy sales tactics that are easy to tune out, lead nurturing builds trust in your business over time, getting your relationship with leads off on the right foot. 6 out of 10 survey respondents who use marketing automation say it has increased the quantity and quality of the leads that get passed to sales (Lenskold Group & Pedowitz Group). Eventually, you have to ask for the sale. So how do you know when a nurtured lead is ready for your sales team? Highly Engaged: A contact that has been very engaged with your content – opening emails, clicking links and visiting your website – is finding value from your marketing efforts. They are probably a strong candidate to reach out to and will be receptive to learning more about your solution. Actively Reaching Out: Obviously, you should follow-up with anyone who requests more information from your website – like requesting product information or scheduling a consultation. However, it’s important to have a good process in place to ensure that everyone is followed up with quickly and that no one slips through the cracks. Use your marketing automation tool’s built-in lead scoring to hand-off high-scoring leads to your sales team. Automate a task or notifications to alert your sales team when a lead visits a specific sales-geared page on your website. Automate a follow-up task for your sales team any time a lead fills out an important form on your website. Lead nurturing wasn’t always in reach for small businesses – mainly because lead nurturing tools used to be super expensive and complicated to implement. Now that there are a plethora of affordable, easy to use marketing tools available, the only thing standing between your business and lead nurturing excellence is a solid lead nurturing strategy.